• To review and assess data on Tamar Estuary dredge spoils provided by LFA. • To undertake a literature review / desktop study of existing methods for treatment and disposal of dredge spoils. • To prepare a report on the above, including provision of preliminary consideration of local options for treatment and disposal of existing dredge spoils. 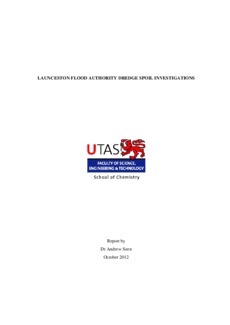 • Part 1 covers a review of the Assessment of West Tamar Silt Ponds undertaken by SEMF in April 2011 and considers acid sulfate soil and heavy metal analyses of the dredged material in the West Tamar dewatering ponds. • Part 2 provides a literature review of some of the existing methods for treatment and disposal/reuse of dredged materials. Due to the preliminary nature of this review the main focus has been on the "ripening" or the chemical, physical and biological processes occurring during dewatering and how this may alter contaminant availability, as well as some consideration of beneficial reuse options. • Part 3 takes into account the nature of the current dredged material and potential options for disposal/reuse, and to provide recommendations for further work.